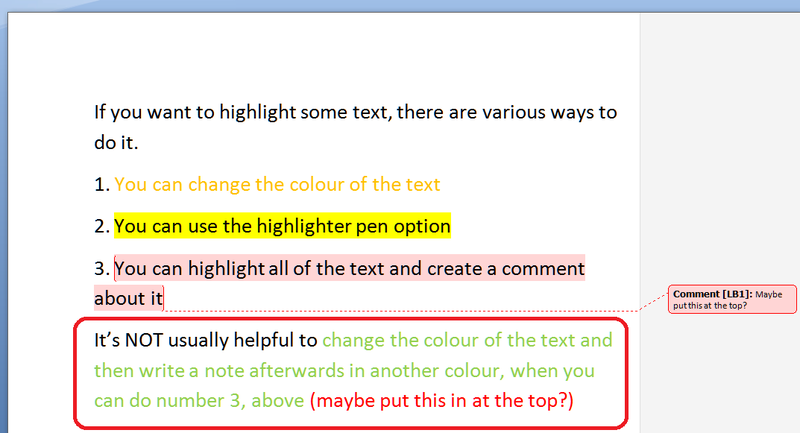 If you are amending a Word document or perhaps working on a document with someone else (a colleague or an editor), it is sometimes useful to be able to highlight some of the text in order to point it out to your collaborator. Here are three useful ways to highlight text in Word … and one TERRIBLE way that you will never think of using once you’ve read and digested this article. This can be useful if you want to mark text you want to change, edit, delete, expand, etc. This can be useful but there is a limited range of colours that are a) legible on a white background and b) sufficiently distinguishable from black. This can be particularly problematic for a reader with a visual impairment or colour blindness. This is all great if you just want to mark, say, chunks of text that you’ve changed so your editor can see what they need to recheck. But if you need to make any comments on that text, pay very close attention to the two methods coming up and make sure you choose the correct one! A comment balloon will appear, and you can type your comment inside the balloon. If your collaborator wants to comment back, they can just add a new comment in a new balloon, and so it goes on. 1. You can skip through the comments using the Next Comment button and you’ll never miss one. 2. You can delete the comments you’ve dealt with, the highlighting will automatically disappear, and you’ll be left with a nice tidy document. If you’re working with someone on a document and you want to draw their attention to something and make a comment, this way we’ve just seen is the way to do it. If you receive a document marked up like this, for each instance of a comment from your collaborator, you’re going to need to change the colour back to normal, delete the comment, or maybe add one of your own. No skipping lightly from comment to comment, but a grim stare at the document to spot the issues. You can learn more about using Track Changes and Comments in other posts on this blog. Please don’t be tempted to try this method at home! So, in this article we have learned how to highlight text in three good and one bad way. I hope you’ve found this useful. Fab as I have sorted my pages and sections in seconds! Thank you. Thanks for your comment – I’m glad I was able to help. Very helpful! I have used track changes and it is a nightmare! So happy to learn about the Highlight-Review-Comment-New Comment method! Will try it today! Track changes is best if you need to make lots of changes or suggestions though – do look at my posts on the subject to reassure yourself about it!